Power. Efficiency. Bandwidth. Werlatone extends it's Combiner/Divider technology with full 700-6000 MHz bandwidth capability. Our 4-Way Combiner, Model D11149, is rated at 300 Watts CW, and operates with less than 0.6 dB Insertion Loss across the full operating band. Measuring just 4.61 x 4.94 x 1.17" the unit is compact, and designed to handle the most stringent environmental conditions. Werlatone's 700-6000 MHz family of products continues to grow in 2018. Power. Efficiency. Bandwidth. 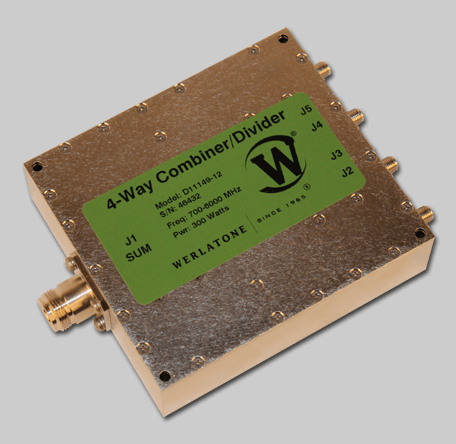 Werlatone extends it’s Combiner/Divider technology with full 700-6000 MHz bandwidth capability. Our 4-Way Combiner, Model D11149, is rated at 300 Watts CW, and operates with less than 0.6 dB Insertion Loss across the full operating band. Measuring just 4.61 x 4.94 x 1.17″ the unit is compact, and designed to handle the most stringent environmental conditions. Werlatone’s 700-6000 MHz family of products continues to grow in 2018.